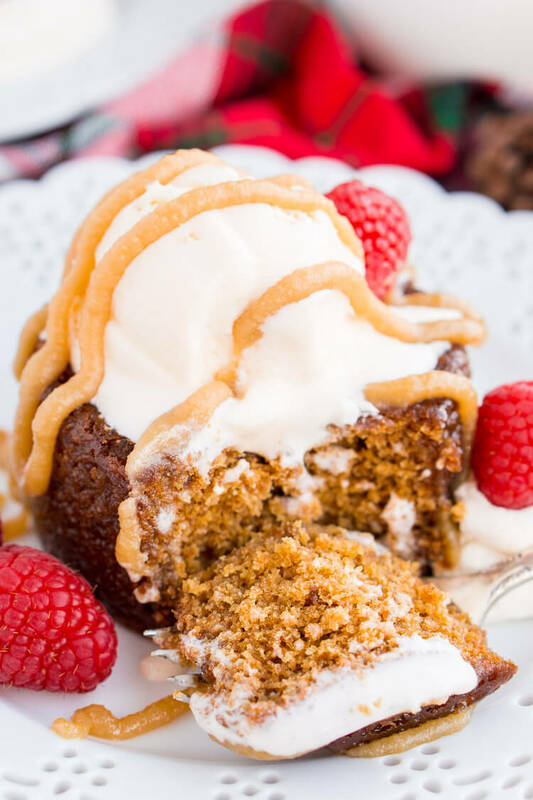 Sticky Toffee Pudding is a rich and cozy cake laced with date puree and soaked in a sticky toffee sauce. 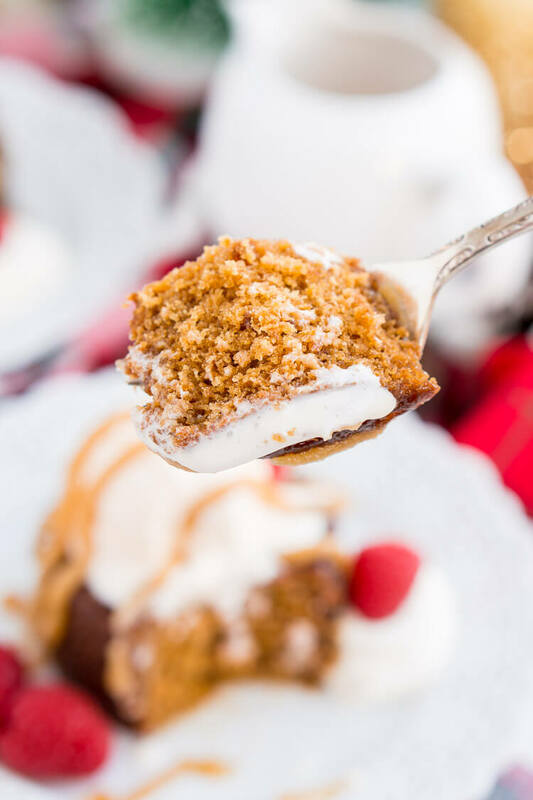 A decadent, sweet, and comforting dessert that can be made up to 4 days ahead of time! 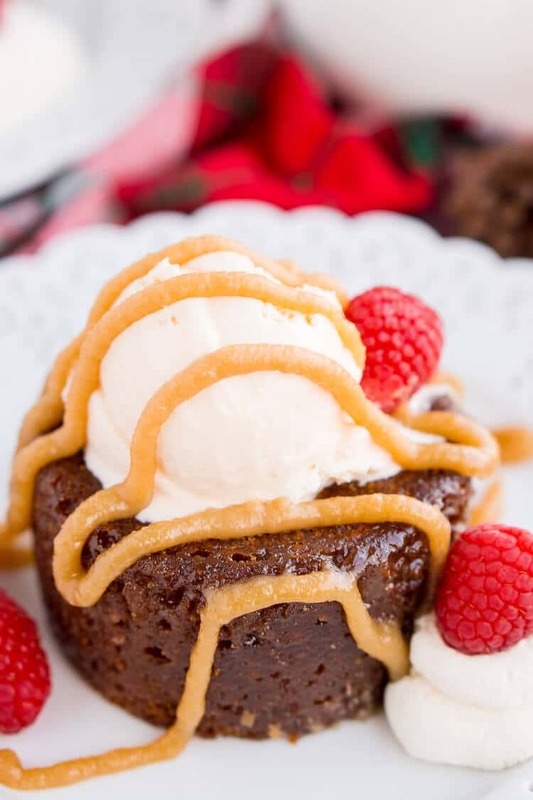 Sticky Toffee Pudding is a classic and bound to be a favorite with the family! Now that my travels are over for the year, I’m settling into the holidays here at home. That means listening to the Ultimate Christmas Playlist on repeat, our annual Harry Potter Marathon, and lots and lots of BAKING! There’s just something about baking that soothes my soul and I feel like it probably does that for a lot of people, even if you’re not good at it. Because if you’re not good at it, there are resources like the eCookbook Chef Creations Inspired By Hood Cream to guide you through the process. 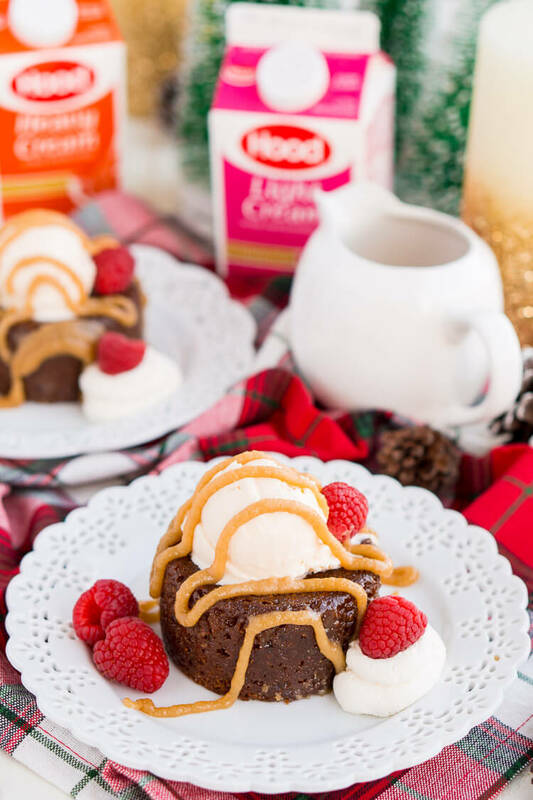 The recipes in that cookbook are all inspired by Hood® Cream and I’m excited to be teaming up with them for the holidays to share delicious recipes like this Sticky Toffee Pudding and my Homemade Cinnamon Butter. Back in September I got to enjoy a fabulous dinner at Deuxave in Boston, every dish used Hood® Cream in a new way, and my favorite, of course, was dessert! Which was this Sticky Toffee Pudding! This dish stole my whole heart that night. It was an incredible finish to a spectacular meal. 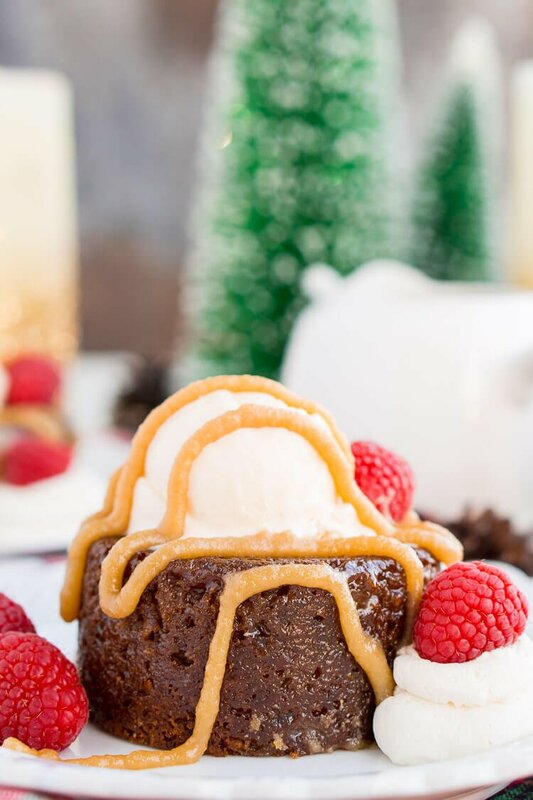 I’ve had toffee pudding before, but this one truly encompassed the cozy flavors I’ve always thought of in my mind. When I was eating it I was whisked away to the lochs of Scotland and the tiny pubs that serve up comfort food like you wouldn’t believe. It tasted like holidays at home and adventures abroad in one amazing finale. 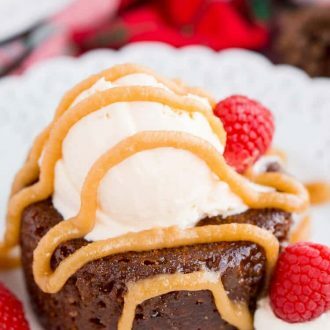 And it’s funny that those are the things it reminded me of, especially since I didn’t have any Sticky Toffee Pudding when I was in Scotland or Ireland last year and I’ve never had it for the holidays. But it made me feel the way I did in those places and during those times. Comforted, Alive, Happy. 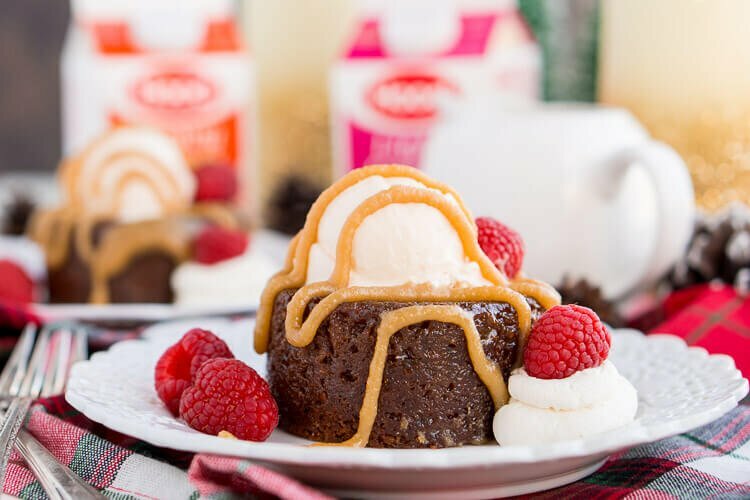 Man, this Sticky Toffee Pudding is some powerful emotion-provoking stuff, and that’s precisely why all of you should make it for the holidays this year! The cakes are baked in individual ramekins, which makes for easy servings and simple plating. 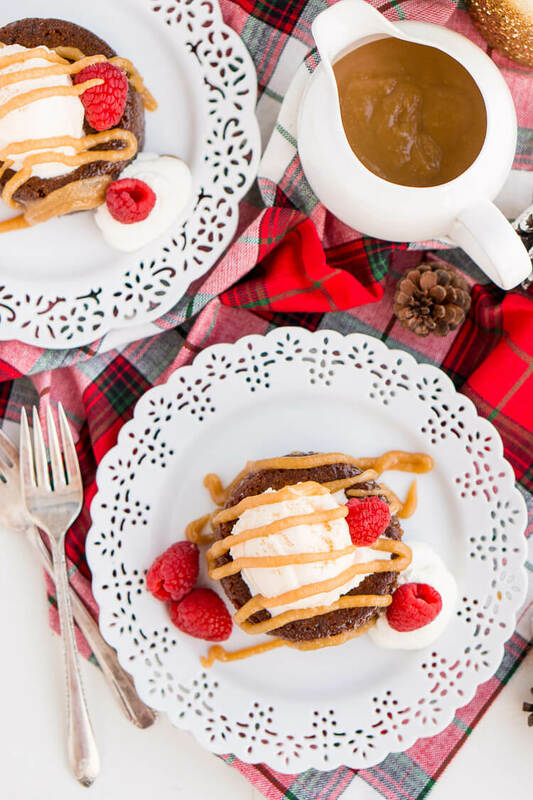 The flavors of dates, brown sugar, and toffee blend for a crazy-delicious finish to the holiday meal. Add vanilla or rum raisin ice cream, whipped cream, and fresh berries or figs to complete the presentation and balance out the thick, sticky, goodness that is this cake! Bring water to a boil. Meanwhile, add dried dates to a small bowl, pour boiling water over the dates and let sit for 20 minutes to soften the dates. Transfer the dates and half of the water to a blender or food processor and blend until a smooth paste forms, add in remaining water and baking soda and puree one more time. In a stand mixer fitted with a paddle attachment, cream together the butter and brown sugar, scraping down the sides as needed. Beat in the eggs one at a time, beating between additions. Combine the flour, baking powder, and salt in a medium bowl. Add half of the flour mixture to the butter mixture and mix until combined, add the light cream and mix thoroughly. Add the remainder of the flour mixture and beat until combined. Add the date puree to the mixer and beat thoroughly. Spray 8 5-ounce ramekins with cooking spray and fill 3/4 full with batter. Place ramekins on a baking sheet and bake for 15 to 20 minutes, until cake tester or toothpick comes clean from center. Remove baking sheet from the oven and cool for 5 minutes. While cakes are baking, make the sauce by combining the butter, brown sugar, heavy cream, and salt in a medium saucepan. Cook for 5 minutes after mixture comes to a boil or reaches 212 degrees F. Whisk frequently. Cool to room temperature and then whisk in the vanilla extract. If mixture separates when cool, beat with a hand blender. Using a serrated knife, slice the domed tops off of the cakes to level them with the edges of the ramekins. While the cakes are warm, spoon 2 tablespoons of the sauce over the cut sides of the cake. Allow to soak for at least 30 minutes. Preheat oven to 300 degrees F. Place the baking sheet back in the oven and reheat the cake for 5 to 7 minutes. Remove from the oven and gently run a small knife around the edges of the ramekin to loosen the cakes. Invert onto a serving plate and serve with ice cream, whipped cream, fresh berries or figs, and more toffee sauce. Once soaked, cakes can be stored in refrigerator for up to four days. To serve, bring the cakes to room temperature then bake in a 300° F oven for 8-10 minutes to heat through. Drizzle sauce over cake and serve. Find more great recipes on the Hood website and don’t forget to follow them on Facebook, Instagram, Twitter, and Pinterest. 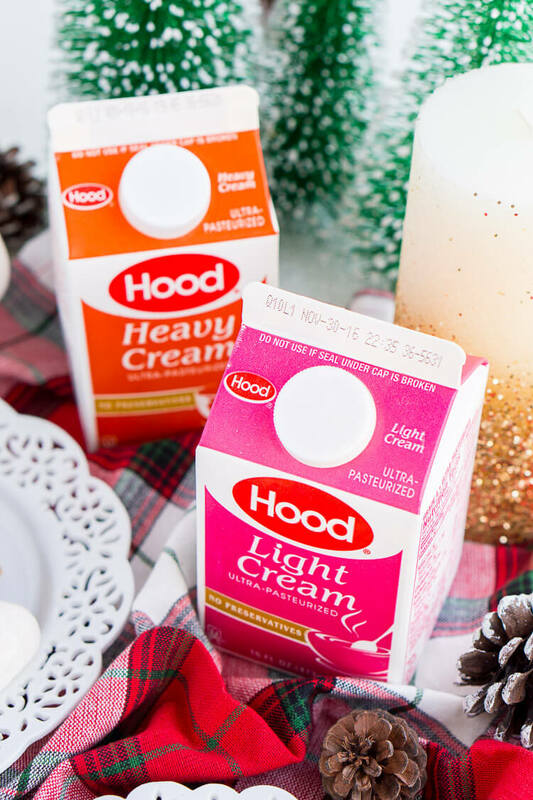 I absolutely love hood cream too! And what you did with this is spectacular! Thank you so much, Kristen! Isn’t Hood Cream just the best!?!? Yum! I love that you can make it ahead of time!